Today I wanted to share with you a little project going on around our place. We’re redoing our stair railing! The newel post, banister, spindles and railing leading upstairs in our home felt a little dated. 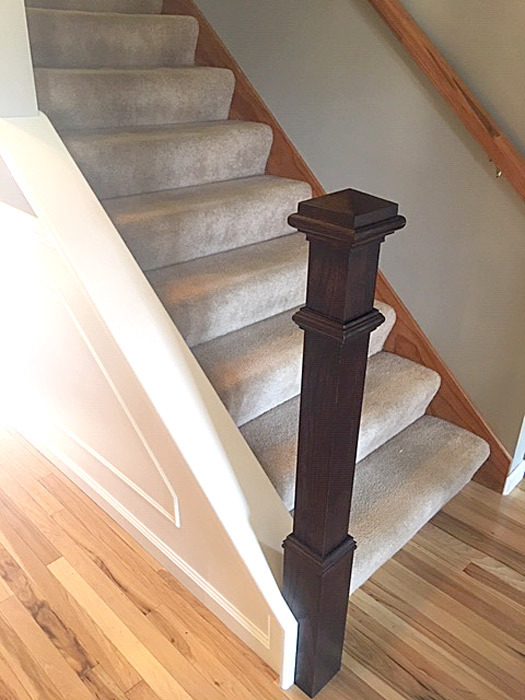 Since this stair railing is one of the first things you see when you come through the front door of our home, we decided it would be a good idea to update it. But we knew it was going to be a tricky project … and that has turned out to be true. This is what the stair rail looked like originally. Meh. About a year or so ago, I got this brilliant idea to paint it white, which turned out hideous and started to wear off where the handrail gets the most contact. I don’t have any pics of that disaster, so you’ll have to take my word for it. The next move was to figure out how to get it done inexpensively. 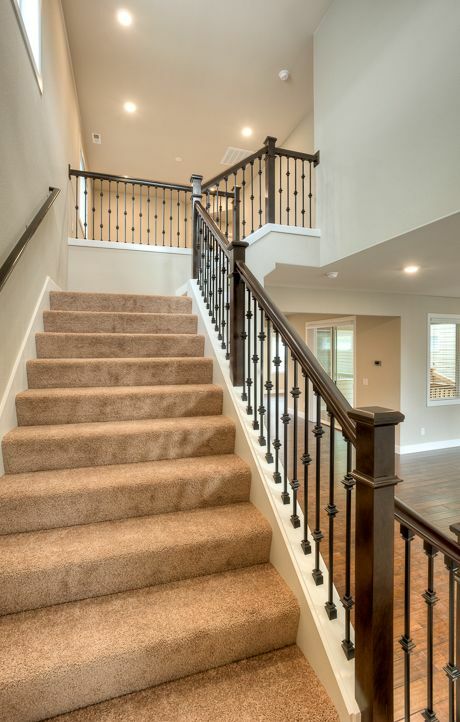 I purchased the wrought iron spindles online from Stair Supplies. They have a great selection. I bought the newel post unfinished off the shelf at Lowe’s for about $100. 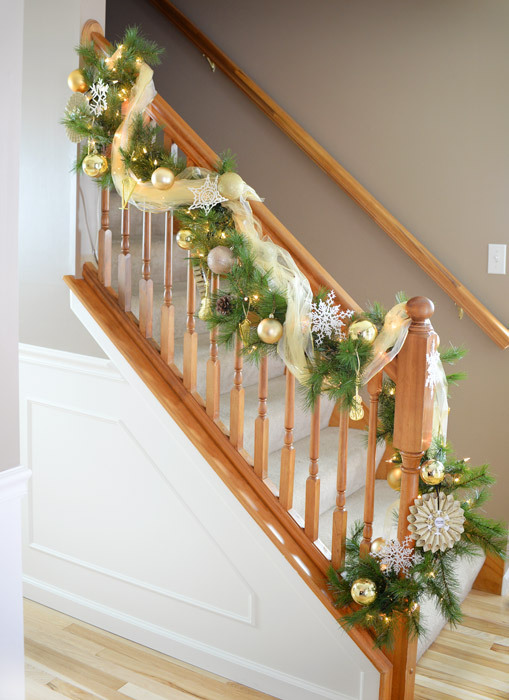 I had an unfinished banister on hand from a pile of trim I bought at an auction for $2. So that was a huge score! I stained all the unfinished pieces in a color called Moorish Teak. I also primed and painted the knee wall trim white to match our DIY wainscoting and other trim. Of course, we had to demo the old railing. 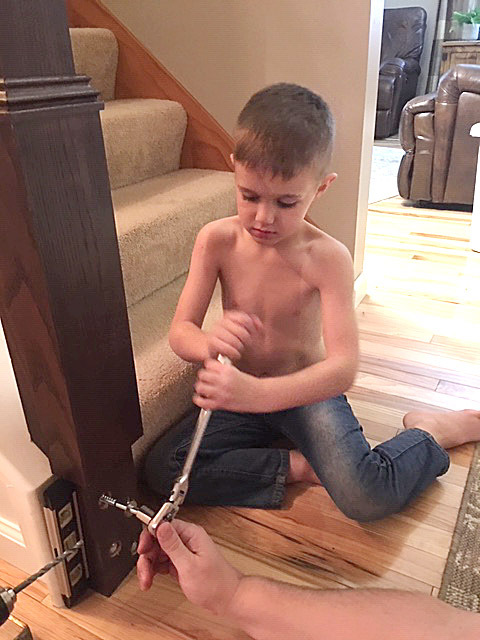 Then big man and little man installed the new newel post. Here’s where we are right now. Our plan is to get this thing totally done by Thanksgiving, since the whole fam will be here. Wish us luck! Have you started any projects in preparation for Thanksgiving?